John McGillvray and Oswald Briely : Catamarans, Brumer Island, New Guinea, 1850. Next morning we were visited by a party of natives from the neighbouring island, consisting of six men in a canoe, and one on a catamaran or raft. They were perfectly unarmed and came boldly alongside with a quantity of yams and coconuts for barter; when their stock was exhausted, they returned for more, and, accompanied by others, repeated the visit several times during the day. 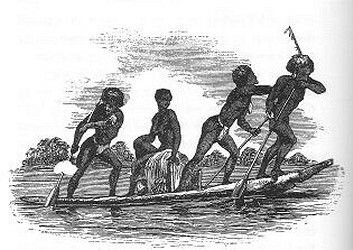 Although there was no obvious difference between these natives and those of the southern portion of the Louisiade, yet the catamaran was quite new to us, and the canoe differed considerably from any which we had seen before. 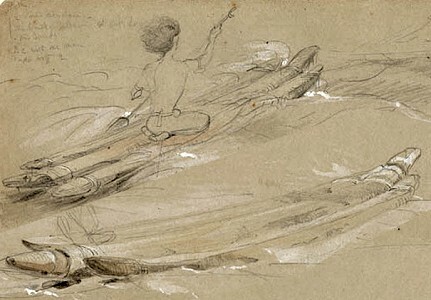 The first catamaran was only nine feet long--it consisted of three thick planks lashed together, forming a sort of raft, which one man sitting a little behind the middle, with his legs doubled under him, managed very dexterously with his paddle. We afterwards saw others of a larger size, some of them capable of carrying a dozen people with their effects. One of this description is made of three logs--rarely two or four--laid side by side, and firmly secured to each other with strips of rattan at each end, and in two or three other places. The upper surface is smoothed down flat, and the central piece projects a little way at each end which usually shows some rude carving touched up with red and white paint. As the sea washes over a catamaran during rough weather, on such an occasion a small temporary stage is sometimes erected in the centre, and on this the cargo is secured with strips of cane. Catamaran and Riders, Bruinie [Brumer] Island, New Guinea. - McGillvray: Voyage of H.M.S. Rattlesnake, London, 1852, Volume 1, page 12. Catamaran and Rider, Bruinie [Brumer] Island, New Guinea, detail and adjusted. The similarity with the Madras catamaran is remarkable, except for the sculptured prow used in New Guinea, and this three log design provides the template for the rolled-bark or reed canoe of Tasmania, see below. Geoff Cater (2014) : McGillvray and Brierly : Catamarans, New Guinea, 1850.